Wat Aham signifies "The Monastery of the Blossoming Heart". This temple was surely a place for mediation and meetings between spiritual culture and Buddhist practice. Neighbouring the Wat Vitsoun, it is relatively quiet even though the district has in the last few years, become the centre of Luang Prabang’s night life. You will notice the 2 stylised stucco tigers guarding the pagoda, and the statues of the temple guardians Ravana and Hanuman (central figures of the Indian Ramayana epic and their Laotian equivalent, the Phalak Phalam) which stand at the Southern and Eastern corners of the front porch. 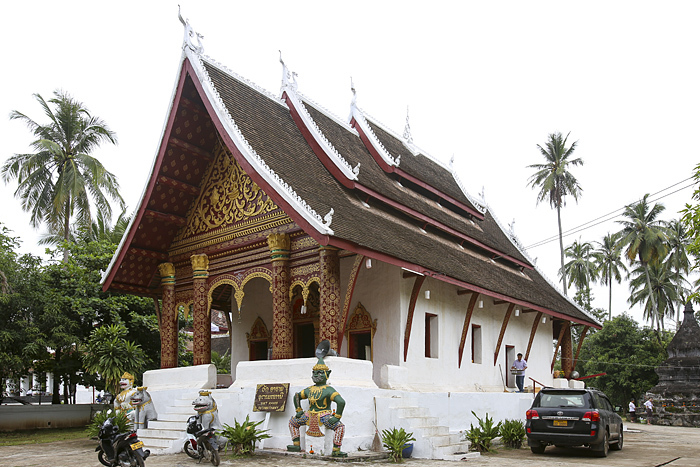 Unlike a certain number of other pagodas in Luang Prabang, there is no outside decoration on the walls of the porch. There are also a number of stûpas and 2 "Bhodi’s" (banyan or Bo trees). 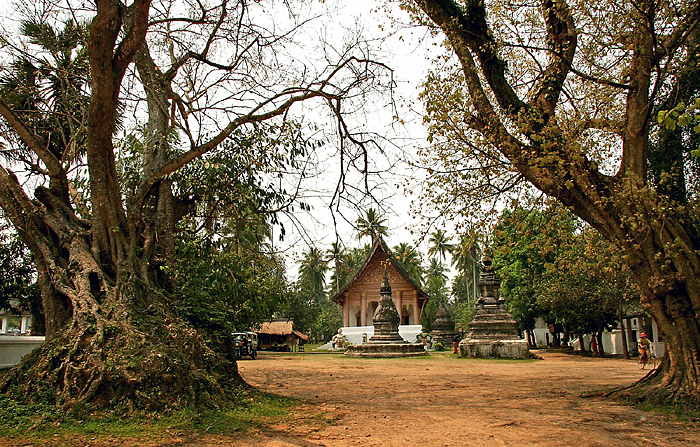 These trees provide a shrine for the protector of the royal spirit, the Haw Phi Khon. 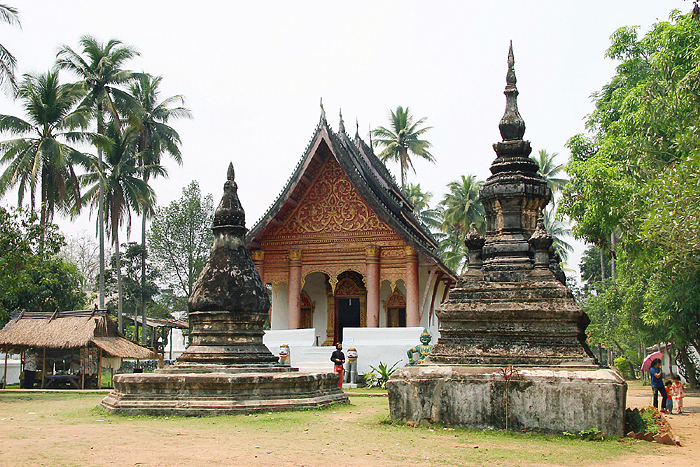 For the greater part of the XIXth century, but before the Wat Mai succeeded it, the Wat Aham served as the Residence of the Sangkhalat, the Supreme Patriarch of Buddhism. It was also considered the cultural centre for the guardians of Luang Prabang, the Devata Luang spirits : Phou Gneu et Gna gneu, whose masks and dances are always present during ceremonies, especially during the Lao New Year. Wat Aham, the "Monastery of the Opened Heart" ("Le Monastère du Cœur épanoui") much of the time is serene, except when children from the near-by school are passing through the grounds. The serenity is also in contrast to its sometimes contentious past when it served as a mediating, or perhaps meeting, ground between the animist religion of spirit guardians and Theravada Buddhism. The wat lies adjacent to Wat Wisunalat and that monastery’s uniquely impressive That Makmo (the Watermelon Stupa). 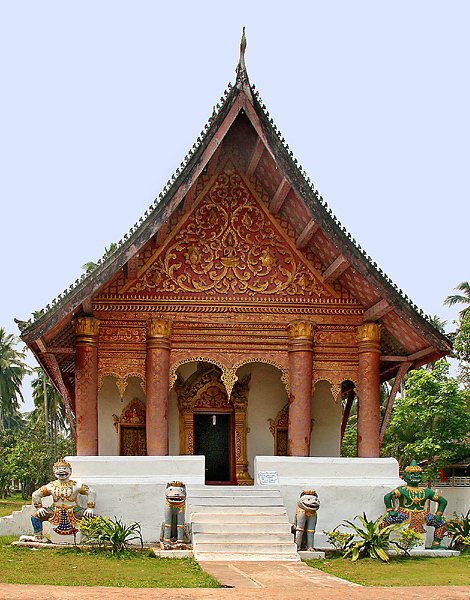 The date of the founding of Wat Aham itself is not known, though there was a wat on the site before King Manthatourath (r. 1817-1836) constructed the fine present Luang Prabang style sim in 1818 (some suggest 1822 or 1823). The sim has a relatively simple form with similar porches on the southeast and northwest façades; there are no external lateral galleries. Stylized stucco tigers guard the front entry steps, and statues of temple guardians Ravana and Hanuman (central figures of the Indian Ramayana epic and its Laotian counterpart, the Phalak Phalam) stand at the southern and eastern corners of the frontal porch. 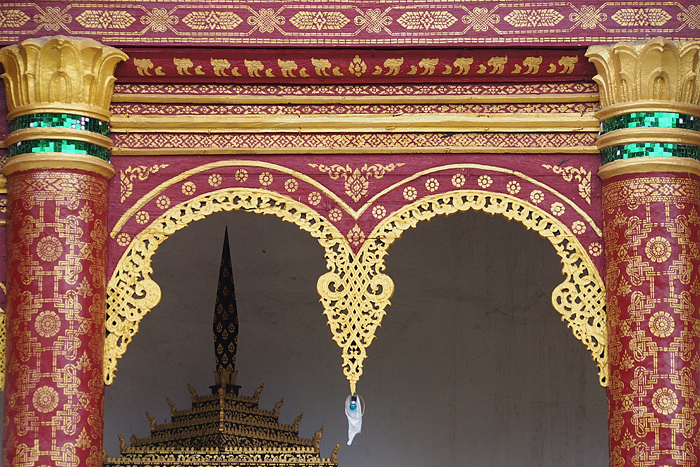 Unlike a number of other Luang Prabang sims, there is no external decoration on the walls of the porch at the frontal façade. The sim has a triple layered roof with two segments above the primary roof structure. 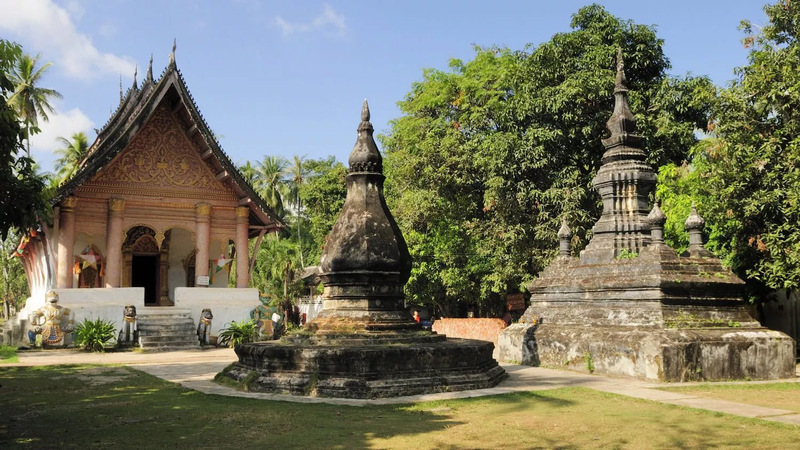 There are a number of mildewed stupas on the grounds as well as two large and quite significant Bhodi (banyan or Bo), trees where there is a shrine of the royal spirit protector, Haw Phi Khon. The interior of the sim is bright and colorful. 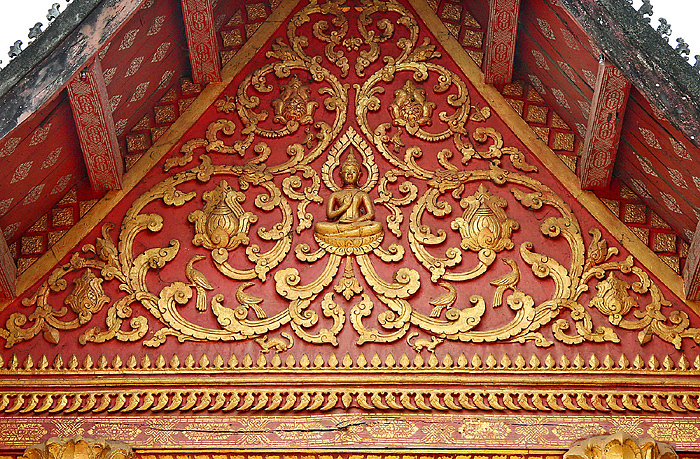 Structural elements of pillars and beams are painted in reds and gold, while the interior walls are covered with murals depicting Buddhist theological precepts, scenes of a variety of torture and suffering experienced by those who inflicted evil on others, as well as elements reflective of the historic past of the city. The site on which Wat Aham presently stands has historical and cultural importance that stem in part from religious conflicts and tensions in the sixteenth century. The founder of the Lan Xang kingdom, Fa Ngum (r. 1353-1373), a Lao prince raised at the Khmer court at Angkor, established here a tutelary shrine for worshiping the guardian spirits of Luang Prabang (devata luang), Pu No and Na No (Phou Nheu and Nha Nheu). Fa Ngum also made Theravada Buddhism the state religion. Beginning in 1527, however, the devout ruler of the Lan Xang kingdom, King Photthisarat (r. 1520-1548) began a concerted attack on the worship of the guardian spirits. He banned religious ceremonies in their honor, destroyed their shrines and erected a Buddhist monastery on the site of the former spirit shrine (this was an earlier, not the present monastery). Some discrete worship of the guardian spirits continued despite the ban. Shortly after the attacks on the guardian spirits the city was beset by a number of crises, including disease, drought and crop failure; in the popular mind the destruction of the shrines had brought the disasters. 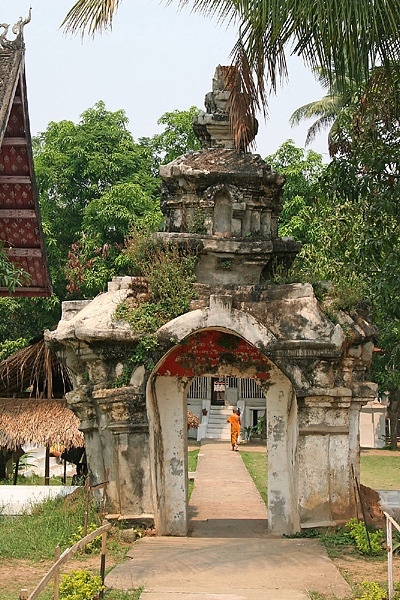 After King Sai Setthathirat (r. 1548-1571) moved the royal capital to Vientiane in 1563, the spirit shrine was rebuilt. The spirit gods and Buddhism lived together until the mid-twentieth century, when the spirit shrine was destroyed. The spirits of Pu No and Na No, by this time had achieved embodiment in the two large banyan (bodhi, or bo) trees that stood on the monastery grounds. Such trees are usually identified as symbolic of the Enlightenment of the Buddha. 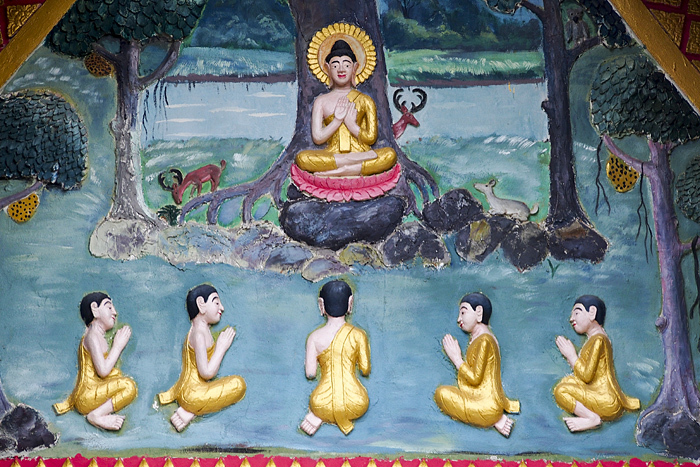 For much of the nineteenth century, before Wat Mai succeeded toward the end of the century, Wat Aham served as the residence of the Sangkhalat, or the Supreme Patriarch of Laotian Buddhism; at the same time it also remained the center of devata luang worship. There is a small structure on the grounds that continues to hold ancestral wooden ritualistic masks associated with the guardian spirits. During Bun Pi (Mai Pimay), the Laotian Lunar New Year, the masks are taken from their storage (in gilded chests suspended by ropes above the ground) to play an important role, the "Dance of the Masks" in the pageantry of the festival. Even though Wat Aham no longer is at the very center of the city’s religious activities, it remains vitally significant to the heritage of Luang Prabang with its combination of intertwined guardian spirits and Buddhist practices becoming especially visible during festival periods. 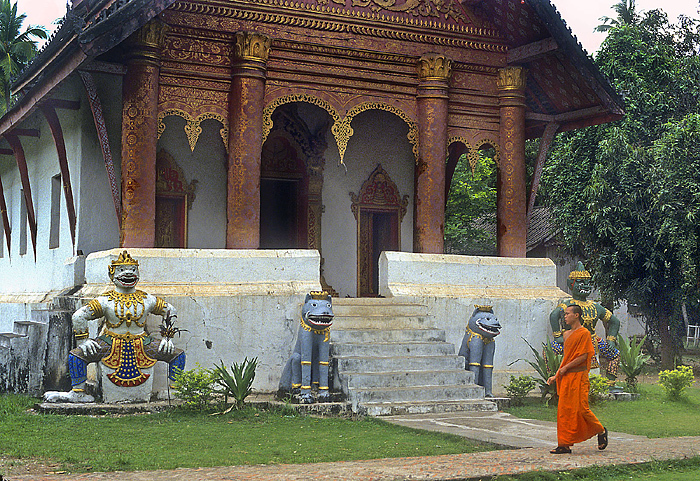 It thus continues to serve as a significant religious center of Luang Prabang.